So i have done some reading as usual and i came across a little gem of a setup for people who are on doing cakes and plan to keep doing cakes for a little bit. In the cake world The Poor Mans Pod is considered the best for automatic fruiting chamber outside of a martha. I figured i am not ready for a martha and wanted a simple inexpensive solution for fruiting without having to run and fan/mist every few hours. Now that you have all your supplies its time to get cracking. Take your dremel/hacksaw/something and cut the metal rack to fit the inside of your tote. Leave a little extra room on the end so that tension will hold it in place. Also make sure to keep the rubber ends if your rack comes with them. Now that you have a rack for your tote take it back out and set aside for a while. Take your two airwands and place them in the bottom of the tote going longways. You pretty much want to place it on the edge of the tote. Now grab your hosing and attach it to the farthest air wand from the back. Make sure you push it on there good. leave enough hose in the tote so it doesn't pull the air wand and cut it where you want to place your air pump. Always leave yourself extra hose just in case. I left a good foot or so so i can loop it down a dresser to drip any moisture that travels along it. Now do the same thing for the second air wand. Take your tool and cut out a notch for your hoses so you can close the lid without pinching the hose. Now take your hydroton and give it a good rinse. You want to get all the dirt and dust off it before you use it. After its done rinsing you want to go ahead and fill the bottom of the tote with it. Put enough in there to cover the air wands and about 1-2 inches above the air wands. The hydroton will hold your air wands in place once you have it settled. Adjust your wands if they moved around while filling. 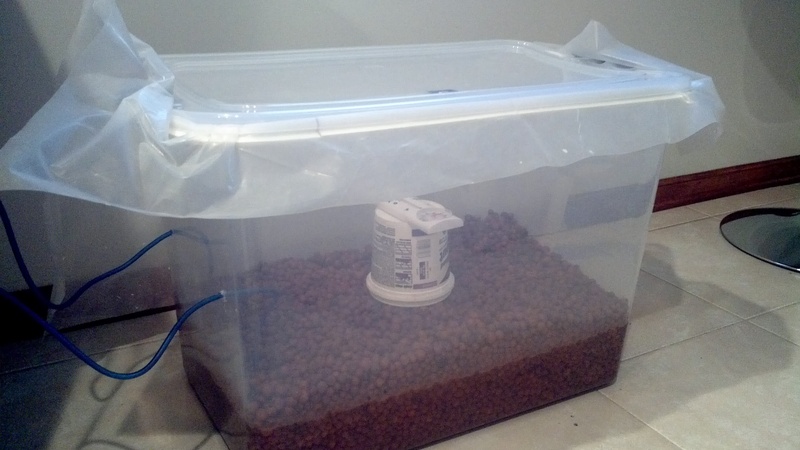 Once done fill your tote with a few inches of water. 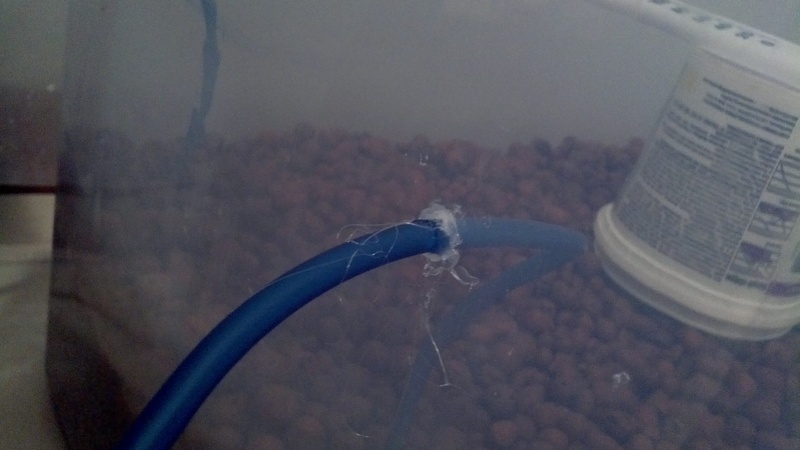 You want enough water in the tote so you can see air bubbles coming off your air wands. Dont put so much that everything is floating. You should have a good layer of hydroton outside of the water. Now that your Tote is filled with water and hydroton its time to finish up. Take a dremel/Drill and drill a few holes about 1/2in above your hydroton line. This will allow Co2 to be pushed out by the incoming air. I also put some holes in the lid. Now its time to put in your shelf and you are ready to fruit. Thats pretty much it. I did this because i was tired of the shotgun fruiting chamber. Shotgun is cheaper but more maintenance. Yeah i like it because it don't look all horrible like most things i do lol.... Anyways not sure what the RH is staying at because my hygrometer is super cheap put even its been pinged at 90% since i put it together. Just gonna watch it a few days for water consumption and FAE.... i have some pins im going to keep an eye on to see if there not getting enough. I might need another air pump. I like your pod sir. Good write up! Waw Nice Tek Neo .Never hear About Hydroton. sHould Go Chek Around To find Sommes . Thanks !!! I would think the nylon(synthetic) type door/window screening would work well. 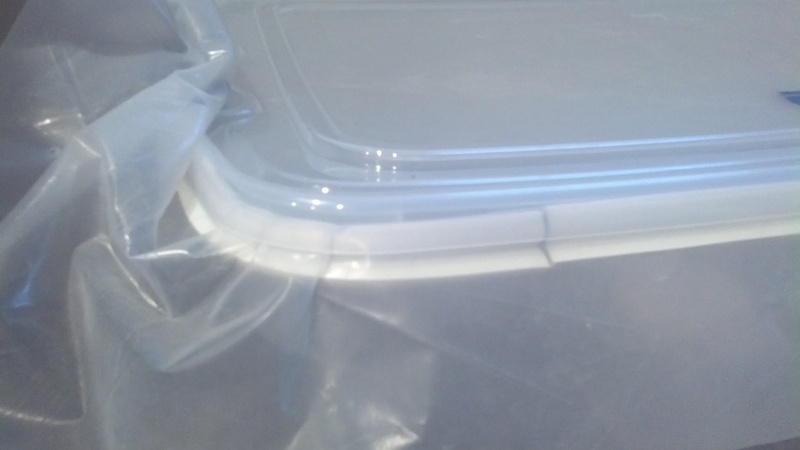 No oxidizing, white crust and synthetic is easy to rinse and keep clean. I just finished building my PMP but I can't seem to get my humidity above 75-80%, any ilollypopss where I have gone wrong? I had the tub built with the rubber seal off, but putting it on did not help. I then added the foil but I did not see a differance either. are you fanning it out? if so, how often? Fanning? Why would I fan with nothing inside the chamber? I'm just trying to get the conditions absolutely right. Is your humidity gauge correct, some of the cheap ones that are for outdoor monitoring are never right and there's no way to calibrate them. I was at walmart and they had like 10 diffetent makes and none of them read the same. Some were 40% different than the one right next to it. You can get a zoomed hygrometer for like 10 bucks from petsmart or any petstore. They should carry something to calibrate it as well. I figured i am not ready for a martha and wanted a simple inexpensive solution for fruiting without having to run and fan/mist every few hours. Do you have to mist with this setup? What kind of RH does the setup maintain? Would it be acceptable for Pans and Mexicana? I'm sure there would have to be constant FAE. nope no need to fan or mist. It keeps about 90-95% humidity. I cant speak for Pans ans Mex but it probably wouldn't be optimal for them. PMP tend to run a little short on FAE. There pretty damn good for cubes. Things that need more might not do so well. With my pump and tub size i think it worked out to .02cfm and about 1 full exchange every 3 hours. Its great for cakes and getting started in trays. I think that pans could work with some modifications. Thanks for the write up and thanks for the reply! I feel stupid asking questlions because it seems like I followed the steps.... I got another Hum Guage and it seems to be reading more accurately but im still not close to 90%. I have the Fusion quiet power 700 pump, its a variable air pump http://www.amazon.com/JW-Pet-Company-Fusion-Aquarium/dp/B0018CLGC0/ref=pd_sim_petsupplies_1	and two of these air stones http://www.amazon.com/Green-Mineral-Airstone-Shape-Aquarium/dp/B0050HC8CG/ref=sr_1_3?s=pet-supplies&ie=UTF8&qid=1347327812&sr=1-3&keywords=airstone. I have tried setting the pump on high and low, and got nothing. Should I drill bigger holes? at the top? I have two on either side of the tub, about 1/8 size holes. Do I actually have to have cakes in there to get to 90%? Or do i have to get to 90-95% before I put them inside. you will be fine with 80 % RH , that is muggy!! you do not have to have the RH up before you put the cakes in , as the pump moves air thru the water it will cause the water to become the RH of the chamber and the air flow of this will give you the correct FAE and evaporation for pinning to occur. the pour mans pod is a auto chamber, it does the fanning and misting all in one.